The long-due post in a chain I began last year (wow, that sounds like really long ago!) and is finally going to get completed. 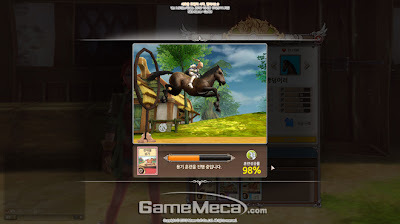 This is translation of a preview of Alicia Online 2.0 aka 앨리샤 2.0 on a Korean gaming website GameMeca. The Part 1 you can read here, and there’s also another post about Alicia 2.0 Frontier test with lots of screenshots and info. The preview has lots of info and screenshots, and i did my best to translate it. It’s not a literal word-by-word translation, you see, as i had to use 3 different translation tools to get the best picture of what is it they’re writing about, but i’m positively sure i preserved most of the info. So, here it goes. Training card system increases fun of growing a racehorse. With all the changes in Plaza and reorganisations of Alicia 2.0 it doesn’t stops with horse growth and management. Each horse has 5 stats (agility, courage, strength, competition and breakthrough that can be grown according to the wishes of gamers. 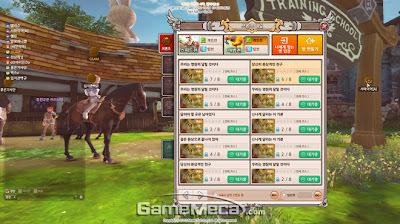 Items necessary for the horse growth are training cards, and there are a daily login and racing bonuses to get those. The cards are classified in 6 grades between F and S, the closer the class of a card gets to S, the bigger bonus to training it gives. On the other hand, the higher the stat change is, the more other thats will get affected and decrease, so it’s important to keep the stats in balance. Motivation to keep playing makes a positive contribution to gameplay. Before getting higher ranking was the only prize, now awarding players with training cards of different value turned out to be a great way to make races way hotter. Training card system wants to kill two birds with one stone: to stimulate competition and get positive reviews. lly with big-shiny-eyes look. The same goes for all training cards – random failure, success and the process of watching horse training are all fun. In Alicia 2.0, the racing itself is also improved. There is a new ranking system now, with bronze, silver, gold and platinum ranks following each other. Previously, beginners were at a disadvantage often competing with mode advanced players, now they can play against each other to get more fair chances. The system is hardly new and it’s good to see it finally added. Also, more magic spells are added to bring more fun to the racing, such as “hammer” that lowers opponent’s speed for a certain amount of time, and “rope” that can be tossed around to grab a player running ahead, which is new and fun. Entertainment besides the game itself was the biggest Alicia Online’s Achilles’ heel. The main reason for gamers and reporters to learn about Alicia Online was IU, it was “IU’s game” for many. For the past year the game wasn’t buried in promotion and PR anymore, its dark age ended and it’s features can now be fully evaluated. Alicia 2.0, with its changes to content, reorganisation and shift of focus for sure gives enough impression on its own. Of course, the beta test did not show enough to determine what this game will turn out to be, but now that Alicia is finally escaping the shadow of IU’s name, it has enough to offer gamers to come back and take a close look at it again. Alicia 2.0 Frontier Test – Screenshots and info from the new version of Alicia Online!